Thursday night: Clouding up, sprinkles. Lows in the 50s. 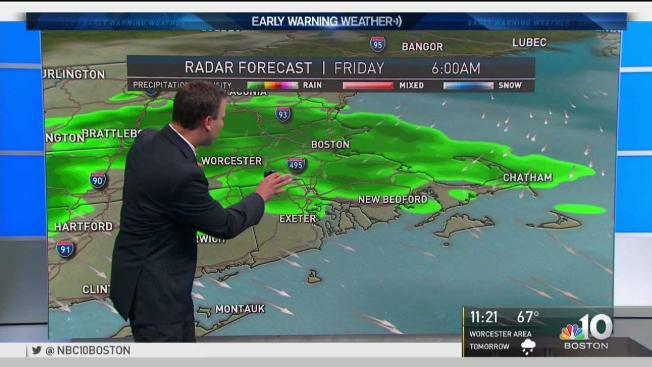 Friday: Early morning showers. Clearing skies. Highs in the 70s, 60s coast. Saturday: Summer warmth, but not humid. Highs in the 80s. For this time of year it's a pretty strong storm slowly moving out of Maine tonight. To the north side of the low pressure center temperatures in the 40s today set records for cold high temperatures today. South of the storm many parts of New England started off with a blue sky that turned into a heavy gray during the afternoon. Wind from the west gusting past 35 mph with temperatures in the 70s to 80°. Tonight a cold front is pushing south across New England generating a few rain showers, and much cooler air for the morning. It is jacket weather to start off our Friday with temperatures in the 30s and 40s north, and 50s to near 60 south. We also have an upper level low pressure system generating showers from Vermont through southern New Hampshire, Massachusetts, Connecticut, and Rhode Island. Areas of rain will shrink with slow emergence of sunshine. Where the sun is out all day we warm to the 70s in northern New England, in the 60s south with the clouds blocking the sun much of the day. High pressure from Canada takes over for the weekend. What is initially cool air, it rapidly turns warm as the wind comes around from the southwest for most of New England by Saturday afternoon. There may be a subtle feature that causes an onshore breeze at some of the beaches in Massachusetts and Maine where we may be in the 70s Saturday but for most of us we warm well into the 80s. Low pressure tracking it to Ontario Sunday will push warm to hot air for New England, with just a chance of a shower, and high temperature close to 90° as the humidity built late in the weekend. Monday we are hot, to record hot, with a temperature of 90° for most of us, and a few locations may heat past 95°. There's also a front pressing in from southern Canada that may generate heavy thunderstorms especially in western and northern New England before the day is over. We get onto the cooler side of the front on Tuesday, but the front to may stall close enough that remnants from the Pacific hurricane named Bud, may bring appreciable rain to southern New England. We could use that rain and will keep an eye on it.